The Witching Hour: The West Memphis Three: Now What? Pagan perspectives on film, television, and other media. 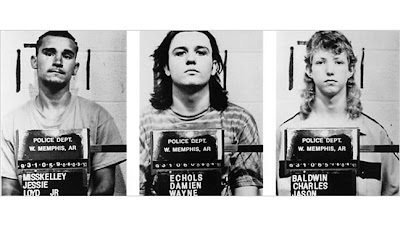 The West Memphis Three: Now What? In the wake of sad jubilation, of righteous anger at justice deferred, of wild speculation about true guilt and feature films and celebrity activism and monetary reparations, I imagine that Damien Echols, Jason Baldwin and Jessie Misskelley, Jr. have little else on their minds beyond holding their loved ones close, eating a decent meal and sleeping in a comfortable bed. What will tomorrow, and next week, and next year, bring for the West Memphis Three? And for those who have followed the case for so long, the journalists (certainly Devil's Knot author Mara Leveritt, whose book is the basis for a forthcoming feature film, is to be commended; she kindly allowed me to interview her back in 2002), the lawyers, supporters, the celebrities and musicians, activists who became friends and advocates of the men during their long incarceration? Well, fellow supporter, I hope you've celebrated this bittersweet victory with a decadent beverage or comestible of your choice. I hope you've reflected on the piss-poor quality of justice in the United States of America, especially for those people can't afford crack legal counsel. Of course, the many lawyers who have worked pro bono on the case for so long are to be thanked and commended, for certainly the men would not be free without their help. Will more criminal defense attorneys be inspired by this victory to donate their services? Let's hope so. And what of the community members and expert "occult crime" witnesses who condemned these men, believing them capable of these grisly acts of murder fuelled by satan worship? What of the so-called news reporters who, to this day, slaver over the words "satanic cult killing" as if they're introducing a saturday afternoon horror movie marathon on the SyFy Channel? What of Hollywood, and its surprisingly positive impact upon the public awareness of this case? (There is no overestimating the impact of the documentary film Paradise Lost on their case; now a third film entitled Purgatory is in about to open in several high profile film festivals.) What of social network media, our lifelines to what's actually happening in the world, and their transformation of our culture in ways those three young men (nor, indeed, any of us) could have foreseen back in 1993. And what of the cultural bugaboo that many would rather pretend never happened, but which surely sealed the fate of these three men in 1993: Satanic Panic? In an impassioned blog post today, Star Foster states that media figures like Geraldo Rivera, Dan Rather, and especially, Oprah Winfrey should apologize for their part in stoking the fires that led to years' worth of ludicrous speculation, rumors and bigotry aimed at anyone involved in spiritual pursuits that didn't conform to Judeo-Christianity. She points to Winfrey's starry-eyed acceptance of the claptrap in the book Michelle Remembers as the basis for at least three episodes of her talk show devoted to the topic. I recall watching one such episode on video wherein Oprah, discussing the murders of a number of people, including an American tourist, by a drug gang in Mexico, in this way: "the only possible explanation is that they were possessed by the devil." To be fair, Rivera did, in 1995, apologize for his part in the media hoopla that helped convict the persons convicted in the Fells Acres Daycare scandal. But he recanted too late to help the West Memphis Three. Damien Echols' interest in Wicca, his preference for black clothing, his love of heavy metal bands like Metallica, his passing familiarity with Aleister Crowley (whose has a number of poems included in the Norton Anthology of English Poetry), were all held up as evidence of his being satanic cult member who was also a killer. Never mind that there was absolutely no evidence at the crime scene or on any of the victims that could be described as remotely connected to cultic, or indeed even occult, activity. Of the many questions, challenges and uncertainties remaining for Damien, Jason and Jessie, certainly one that occurs to me is the enormous importance of not forgetting about the horrific superstitious atmosphere that pervaded the community of West Memphis, and by extension, our nation, in the early 1990s. Attitudes about spirituality and religious practice have definitely come a long way, but how can we prevent this from happening again? I know that these three men will do what they can to clear their names, with the help of the many supporters they have gathered over the years. It is my fervent wish that this case and its legacy serve as a reminder to us all of how easily fear can pervert justice, how easily ignorance can lead to bad decisions, and also how easy it can be to open our minds and hearts, even if it's only a little bit at a time. The Arkansas Times has compiled a long list of news articles spanning the case. albion.peg at gmail dot com. Breaking News on The West Memphis Three!